Fall is here is most of the country. Winter is showing it’s face in certain areas. Isn’t it time you decided to build a birdhouse or two? As a much younger person I failed in attempts at building a birdhouse. I haven’t tried it for years. Maybe it’s time to give it another go. After all, there are so many styles such as decorative birdhouses, victorian birdhouses, garden birdhouses and many more including, and let’s give it a name like “homeowner’s special.” That’s where you don’t use any birdhouse plans and just let your creativity flow. Here’s some interesting general information about birdhouses and why we all should have one or more in our yards. Probably the most appealing and natural attraction for wild birds are wooden birdhouses. If you are thinking of inviting natures feathered friends into your home and garden area, you will want to make sure that the habitat you set up reflects what the birds consider to be natural. There are some drawbacks however, in using a wood bird house. Wood surfaces, due to their inherent properties, will tend to break down and chip off after being exposed to the natural weather elements. If the birds were to accidentally ingest one of the wood chips that is covered with toxic paints or have been treated with harmful chemicals, the bird may die of poisoning. For this reason you will need to insure that your wooden bird house is well constructed and made with quality materials such as cedar. 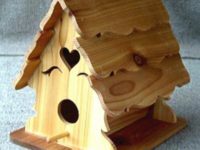 Birdhouses with wooden construction are generally more realistic looking than other materials such as plastic or metal. I know it may seem like a small thing, but birds are not dumb. If you have a nicely built and attractive wooden bird house, the winged birds hovering around your area will notice and want to drop by for a look around. Building a Cedar bird house in your area gives you the benefit of having a variety of these little delightful creatures in your yard. Think of it like this, the birds have many different options as to where they want to set up house. In fact, they visit and look around many different places. If you have a safe and nice looking bird house available, chances are they will stop and call your garden their home. Here is a short video on how to build the basic Cedar Birdhouse. See if you can smell the Cedar and the sawdust as you watch this video. Enjoy! The birds will be happy, you will be delighted and all in all it is a win, win situation for everyone involved. Having birds in the yard is a way to bird watch and relax with nature without leaving your home. The birds are happy with new homes and you get the joy of being able to watch them. Give a little thought to where you want to place your bird house and without a doubt you will find that before long a nice feathered family has moved in. What a beautiful bird house. That would look good in front of our house with the bird feeders. Love your site. Its good to think over doing something nice for others as well like “sweet little birds”. Building a house for them would give you the pleasure you want to experience in your life. Thanks for posting. Decorative birdhouses are a great way to liven up any home or garden. They add beauty of their own in addition to the beautiful creatures they invite.